February 28....Empowering Women Luncheon - The speaker will be Marie Evans who will answer the burning question: "Are We There Yet." Lunch is served from 11:40 if you would like to network. Lunch is $20. Bring a guest and she will eat for $15. RSVP to cblair@bwireless.net; Lubbock Club, 1500 Broadway on the 14th floor of the Wells Fargo Building, 12 p.m.-1 p.m.
February 28....Lubbock Fun Club Singles (SOS) Bowling Night - Come join our fun-loving singles group (generally the attendeeds are mid-40s plus) for an evening out at the lanes. Last time out, over 30 people made it out for the bowling fun! Cost is only $7.60 per person (correct change please). Reservations are required by the bowling alley to accomondate the size of our group, so RSVP to: info@lubbockfunclub.com right away. South Plains Lanes, 5150 - 69th Street. 7:00 p.m.
February 29....Leap Day Movie - Kids are invited for the latest movie installment about our favorite green ogre. Refreshments will be served. For more information, call 775-2835; Mahon Library, 1306 9th Street, 10:30 a.m.
February 29....David Gaschen in Concert - Tickets $35 (students $20), and premium tickets $50. Note: Premium $50 tickets only available by calling 787-0061. Premium tickets include a “Dessert and Coffee” party to follow at the Arnett House, headquarters for the Associates and located on campus. Meet Lubbock native David Gaschen and have refreshments with your friends. General seating tickets available at Select-a-Seat locations or online at www.selectaseatlubbock.com. 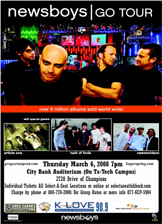 Concert takes place at McDonald Moody Auditorium on the LCU campus. 7:30 p.m.
February 29 - March 2....Home And Garden Show 2008 - Annual event producted by the West Texas Home Builders Association. Adult admission $5; $2 for children 2-12 years of age; no charge for children under 2. Call (806) 798.1616; Lubbock Memorial Civic Center Exhibition Hall, 1501 Mac Davis Lane. Hours for event: Friday 4 p.m. - 8 p.m.; Saturday 9 a.m.- 6 p.m.; Sunday 12 p.m. - 6 p.m.
March 1....2nd Annual Severe Weather Awareness Day - Activities will include several hands-on weather experiments for kids of all ages, live weather demonstrations, information on severe weather preparedness, and door prizes as well as real Storm Chasing vehicles and weather instrumentation. The national Weather Service, whose regional offices are located in the Science Spectrum building, will also be providing a certified Storm Spotter Training seminar and guided tours of their offices to the general public. Additionally, special OMNI Theater screenings of the film, "Storm Chasers" will be featured in celebration of the day’s events. Storm Chasers lets audiences get closer to real tornadoes, hurricanes and other severe storms than most would ever dare! Come out and meet John Robison and the whole KCBD weather crew for a weather-filled day of fun! This is a *FREE event for the general public and will be located in the Science Spectrum’s Atrium, 2579 S. Loop 289. Weather awareness day events run from 11:00 a.m. to 5:00 p.m. Showtimes for "Storm Chasers" on Sat., March 1st will be at 1:00, 3:00 and 5:00 p.m. *Regular OMNI theater ticket rates apply for all films. General Admission ticket prices for OMNI films: $7.50 adults; $6.50 seniors (60+); $6.50 children (3-12). March 1....Big XII Men's Basketball - Texas Tech Red Raiders vs.University of Texas; United Spirit Arena, 1701 Indiana Ave, 3 p.m.
March 1....Del Castillo with special guest Patricia Vonne - Del Castillo continues to pack the house at the Cactus Theater and bring new exciting material every time they come. Get your tickets early for this one because with added Austin powerhouse Patricia Vonne on the bill, the Cactus just might explode! It just doesn’t get any better! This is the place to be the night before the Lubbock Centennial celebration kick-off. Tickets $20.00; Cactus Theatre,1812 Buddy Holly Avenue. 8:00 p.m. One show only. March 2....Lubbock Centennial Opening Ceremonies - Concourse exhibits begin at 5 p.m., and later, local legends including Mac Davis, Joe Ely and Barry Corbin will perform. For more info, visit the official website at www.lubbock100.com. Tickets available at all Select-A-Seat outlets or online by clicking this link. This historic event takes place at City Bank Coliseum, 4th Street and Drive of Champions. Concourse opens at 5 p.m., concert and stage events begin at 6 p.m.
Lubbock Centennial Kick-off Event: A Truly "Must See" Experience! Our David Gaschen Ticket Winner! This week's winner of the tickets for tomorrow night's concert at LCU is L. Jackson of Lubbock. Congrats and enjoy the show! Wanna CRUISE ALASKA in July? 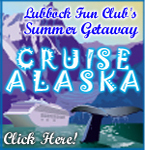 We're looking for persons interested in cruising with the Lubbock Fun Club as a group this summer...and we'd like you to be part of the fun! If you've always wanted to make the trek to experience the serene beauty of America's "last frontier"...this may well be the PERFECT opportunity. Click the graphic to the left for more info and plan to join the fun. Time is running out for us to make decisions, so let us know if you want to go! We'll draw for several pairs of tickets to see contemporary Christian group The Newsboys. Their concert will take place March 6. To enter the contest, type "Newsboys Contest" in the subject line of your e-mail and include your name and contact info...and send to us at info@lubbockfunclub.com. We'll draw for the the winners on Sunday night so get your entry in today. Good luck as always! March 6....SOS Singles Monthly Dinner - Meet at Cagle Steaks (4.5 miles west of Loop 289 on 4th Street). Everyone pays their own tab...no reservations necessary...just come meet a fun group of Lubbock singles (generally age 50+) for a great meal together. 7 p.m.
March 6....The Newsboys Go Tour - Contemporary Christian concert. Tickets $39.25, $32.00, $28.75; available at all Select-A-Seat locations. City Bank Auditorium, 4th Street and Drive of Champions; 7:00 p.m.
March 7 - 8...Cradles 2 Crayons Bi-Annual Children's Consignment Sale - Come see the best in "gently used" children's clothing - Newborn to Pre-teen size, maternity wear, shoes, baby swings, bouncers, feeding/diapering supplies, nursery furniture and decor, outdoor playground equipment, books, videos, bicycles, toys and more. Admission is free; Raintree Christian Church, 3601 82nd Street (on 82nd between Indiana Ave and Quaker Ave.). Special exclusive shopping for Lubbock Fun Club members on March 6, from 9 p.m.- 12 a.m. Note: To enter the early shopping event, you must bring a printed copy of next week's postcard for entry. For more info on the event, click on this link. Public sale takes place 11 a.m.-8 p.m. on Friday, March 7; On March 8, take "half-off" most items from 8 a.m. - 1 p.m.
March 7 - 8....Lubbock Symphony Orchestra presents The Many Faces of the Americas - with conductor Tomasz Golka, Matthew Fuerst - composer, Peter Soave - Bandoneon player and the Lubbock Youth Symphony Orchestra; Civic Center Theatre, 1501 Mac Davis Lane, 8 p.m.
March 28....Ballet Lubbock 2nd Annual Gala: "Prelude to the Dance" - Join Ballet Lubbock as we celebrate the 10th anniversary of Artistic Director Yvonne Racz! Gala tickets are available through Ballet Lubbock and all proceeds benefit our nonprofit programs, including scholarships, outreach classes, performances and more. Support these many worthy programs while dancing to the music of Element, and enjoy a performance by the Ballet Lubbock Company. Reservations strongly recommended; call Ballet Lubbock at 785-3090 for tickets. Underwood Center for the Arts, 511 Ave. K; 7 p.m. - 10 p.m.